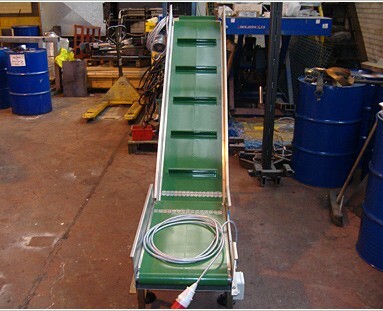 Challenger design and manufacture bespoke conveyors for special applications, the conveyors are designed and manufactured to suit each individual project with the design specification decided in discussion with the clients engineering team. 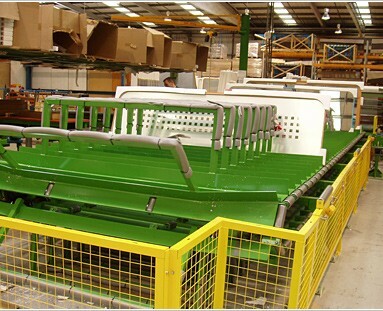 Assembly Conveyors are manufactured to suit the manufacturing process with work stations been incorporated where required, divert and merge station can be integrated to meet the assembly process. Shredder Feed Conveyors are manufacture to meet the clients specification regarding the product to be processed and the site requirements. The conveyors can be driven by either electric or hydraulic drives and be stationary or mounted on mobile shredding units. Vertical conveyors are used to transport product between different floor levels, these can be supplied for the movement of cartons, parcels and pallets. Vacuum Conveyors have been supplied for vertical transportation of sheet products between floor levels. Heat Shrink Tunnel Feed Conveyors are used for many applications where a product requires to be feed through a heat shrink tunnel to provide an outer protective film. Food Processing Conveyors can be supplied as flat belt, wire mesh or plastic link chain belts to accommodate a range of process temperatures. Steel Slat Conveyors are manufactured for the glass and casting industries with a wide style of steel slats available to suit the application.